Vosper: Has the bicycle business reached peak bike? You may be familiar with the concept of Peak Oil, which refers to the rapid decline in sales of petroleum products once the ability to extract oil from various sources peaks and begins to fall. Makes sense, right? 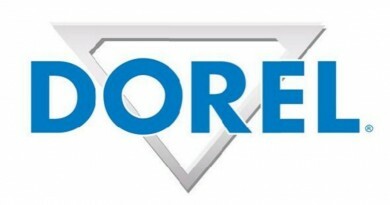 Supply declines, prices increase and eventually consumers look elsewhere. In the case of what I’m calling Peak Bike, the “peak” doesn’t refer to product, but to customers. Currently the industry – at least here in the US – attempts to ignore this problem by selling more and more bikes to an essential static market – you’ve got have your road bike, fixie ‘cross, gravel, town, commute, and coffee-shop bike. And on the off-road side, there’s your hardtail, duallie, single speed, pump-track and so forth…all in three wheel sizes. This can’t go on forever. There’s some finite number of different bike models even the most enthusiastic rider will buy. And more importantly, we’re trying to sell those models to an ever-shrinking pool of riders. To avoid peak bike, if indeed that is possible, this has to drastically change. In addition to more models to the same customers, the industry is increasingly turning to less expensive models to recapture some of a customer segment that’s have been shopping at mass market stores since the 1990s. This is a healthy trend, but it still takes a lot of $300 sales for a retailer to make up the gross profit dollars of a single $2,500 sale. And, as we shall see, all too soon even the $300-bike customer base will be a fraction of what it is today. No wonder shops have been failing at alarming rates for years and suppliers are switching to an “all-season long” discount sale strategy in an attempt to keep volumes up. Which is why I say we’re about to reach Peak Bike, if we haven’t already. But don’t take my word for it. Let me prove it to you. 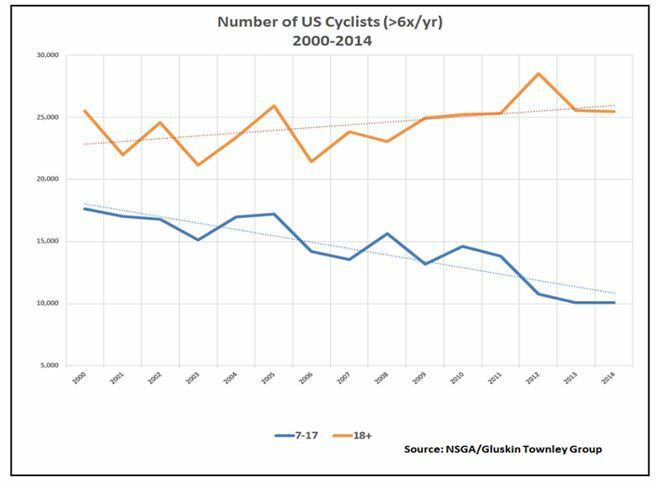 The graphs following are based on statistics from the National Sporting Goods Association (NSGA), courtesy of my colleague and fellow Cycling Industry News editorialist Jay Townley. This graph captures Americans above the age of seven who rode their bikes six or more times per year between 2000 and 2014. 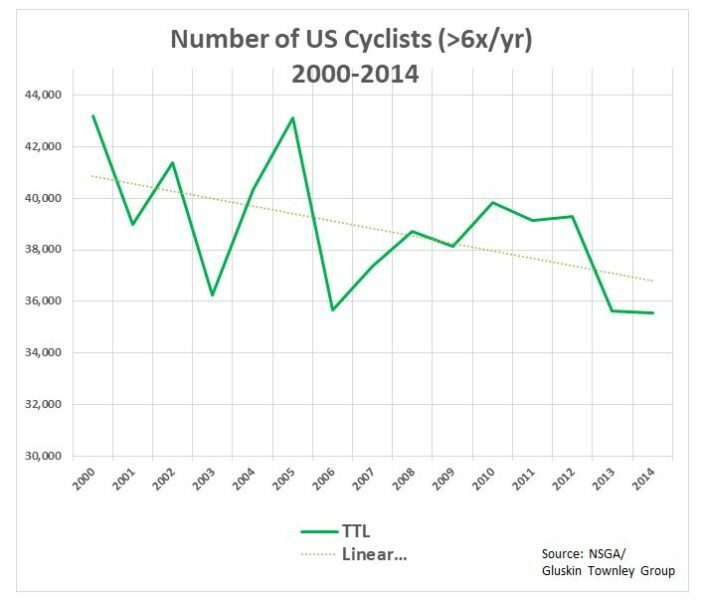 In those 14 years, the number of Americans participating in cycling declined from 43,000 to not quite 36,000, which is about a 16% drop. As a function of population, that rider base has shrunk even farther, by more than a quarter. Bicycles have always been a boom-and-bust industry. It’s true in Europe and the UK. It’s even more true in the US, where transportation bikes don’t provide a reliable sales cushion and the swings tend to be more extreme. Chopper-style bikes for kids, there’s a bump. BMX, there’s another bump. 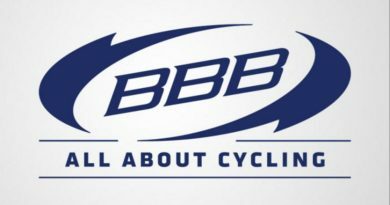 But, at least for specialty retailers, the big action is in adult bikes. Dropped-bar European ten-speeds gave us the US Bike Boom of the mid ‘60s–mid’70s, the highest level of ridership in US history. Then we had mountain bikes in the ‘80s. Full-suspension mountain bikes in the ‘90s. Road bikes again – only fancier and much more expensive – in the 2000s. Each one was a nice revenue bump for the business. And each time the bump has gotten smaller. But that’s not the scary part, either. The above graph is from the same NSGA study shown previously. But this time it’s broken out by age bracket. Don’t be too concerned about the absolute numbers. There are a lot more adults in the sixty-plus year span of 18-80 than there are youngsters in the ten-year span between the ages of 7-17. What’s important is the direction the data’s moving. As you can see, adults (orange) continue to ride bikes. Adult numbers zigzagged in the early 2000s, but have been going up steadily since, even with a flat period for the Great Recession. But kids’ numbers (blue) are dropping at an alarming rate, from 17.7 million in 2000 to 10.1 million in 2014. 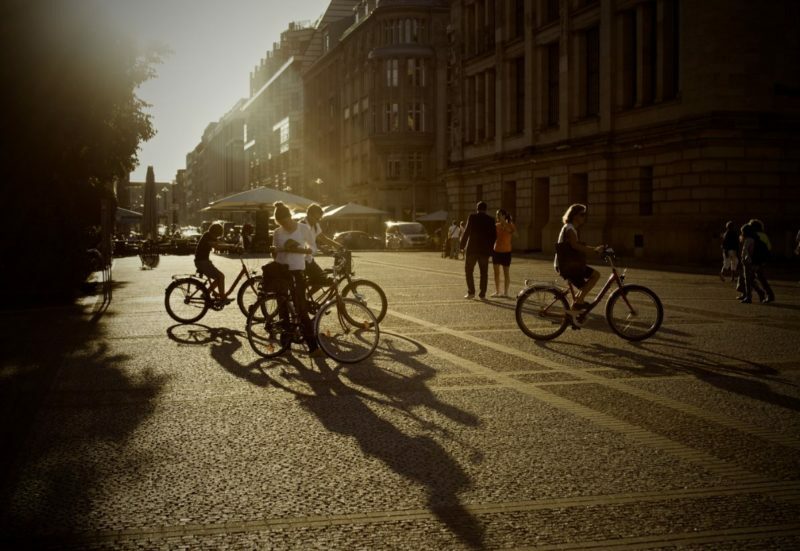 That’s seven and a half million fewer kids riding bikes, a 43% decline in just fourteen years. But while alarming, this data doesn’t mean there are seven and half million kids sitting inside playing video games instead of outside riding bikes. It says there are seven and a half million fewer kids to start with. We’ve seen that the total number of riders is dropping, almost entirely because of a drop in the number of younger riders coming up. 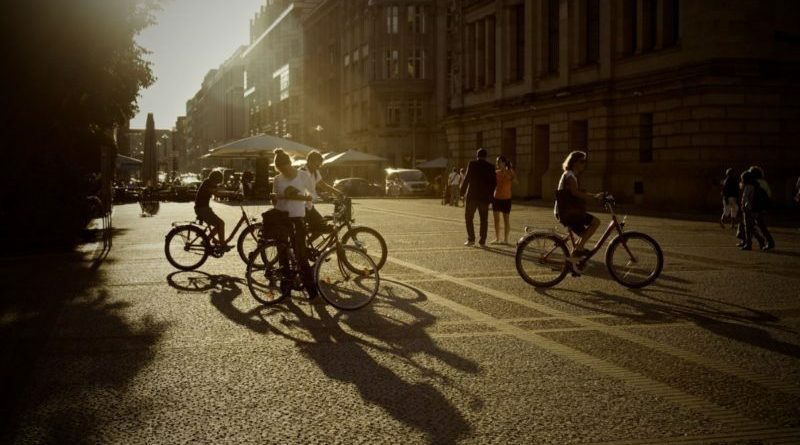 But what we don’t see is that the number of total cyclists will be dropping at an even higher rate. Here’s a chart of births over the hundred-year period, 1909-2009 that shows why peak bike may be imminent. A very large portion of our current rider base consists of Baby Boomers, defined by the US Census Bureau as the generation born between 1946 and 1964 (in red on this chart). The “boom” was not nearly as large in the UK, but in both cases the various post-boom generations – Gen X, Millennials (Gen Y) and Gen Z (born 1995-2014) – are a fraction the size of the Boomers. 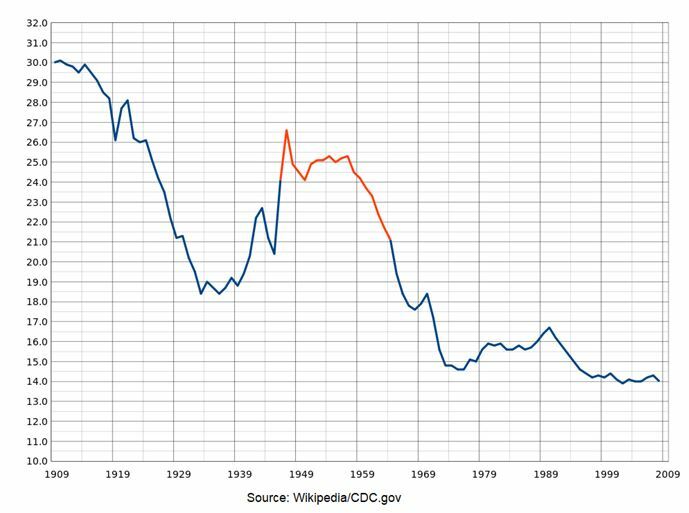 The peak of the Baby Boom was in the 1950s. If you were born in 1954 – right at the midpoint of the Boom – you’ll be 62 this year. And despite notable exceptions, there’s just not as many 62 year olds riding bikes regularly as there are, say, 33 year olds. Which means there’s a double-whammy hitting the industry: more riders leaving cycling, fewer riders coming in. Which means the overall population of riders is about to plummet; and in fact has started doing so already. Over the next 20-30 years, more and more boomers (and eventually, Gen Xers and Gen Y/Millennials) will “age out” of the cycling population. And more and more Gen Zers and then those born after 2014, which some are calling Alphas, will replace them. Ultimately, depending on how long Boomers stay in the activity, in 20-30 years we’ll have a cycling population about half the size as the current one. Which is to say, the bike industry will be working with customer base that’s as much as 50% smaller than the one we have now. And likely to stay that way for the foreseeable future. 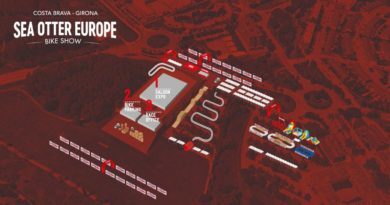 In Part Two, due in the next Trade Journal, I’ll talk about three more huge market disruptors (other than a shrinking customer base) that will further reshape the bike business.